Tibi Top; Isabel Lu sheer maxi skirt, Lucky Brand wedges; Rebecca Minkoff bag; Marc by Marc Jacobs aviators; Forever 21 collar necklace; Michael Kors watch; earrings (old); vintage gold bracelets; DIY shell bracelet. The summer is winding down but the heat is still here. 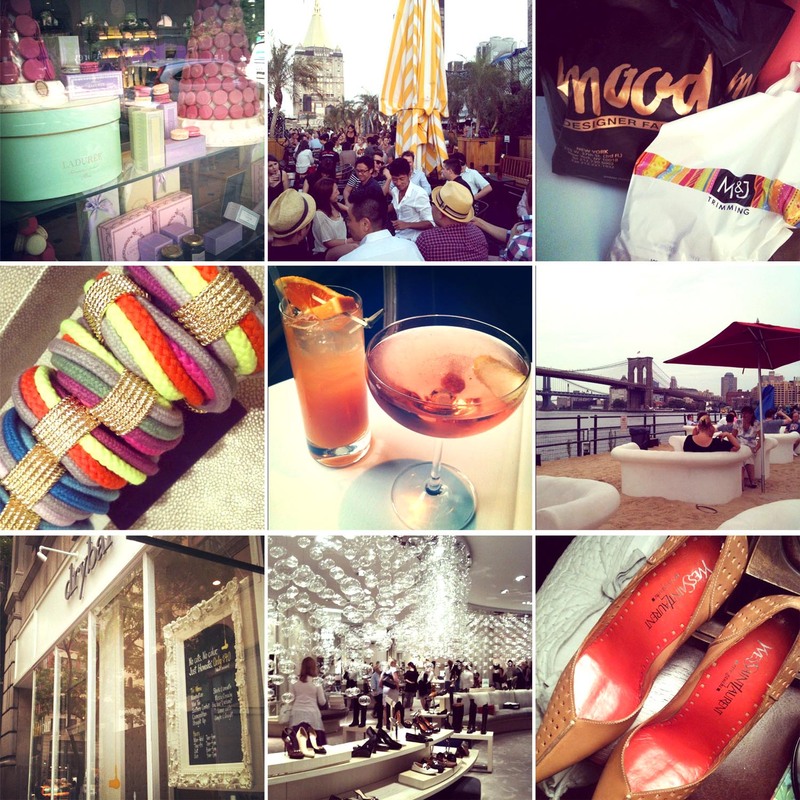 For some reason when I think of August, I think of the color peach. Peach is sort of like the preliminary hue of orange – the color that autumn seeps in and turns all the leaves. For the South, our orange leaves will come around October leaving me with a couple more months of bronze and peachy inspirations. So thrilled to finally be able to share the photos from my fun Sunday shoot with Tate Tullier and his wife Sarah. I’ve been a long time fan of Tate’s photography work as he always has an innovative way of capturing each shot. (Take for example the reflection off the door window in the third image – awesome right?) It was a collaboration match made in heaven as he perfectly translated my vision into these photographs. The only thing not perfect about the shoot was the absolute heat we were in… but Sarah was a lifesaver both patting me down and fixing my hair and skirt for different shots. Together, they were a sort of dynamic duo of photography if you will. Sometimes for me, professional photography can be rather nerve racking, but Tate and Sarah made the entire experience very fun and easy. If you’re looking for a photographer for any reason be sure to check out TTP! Following him on Facebook and Instagram (@tatephoto) is pretty cool too. 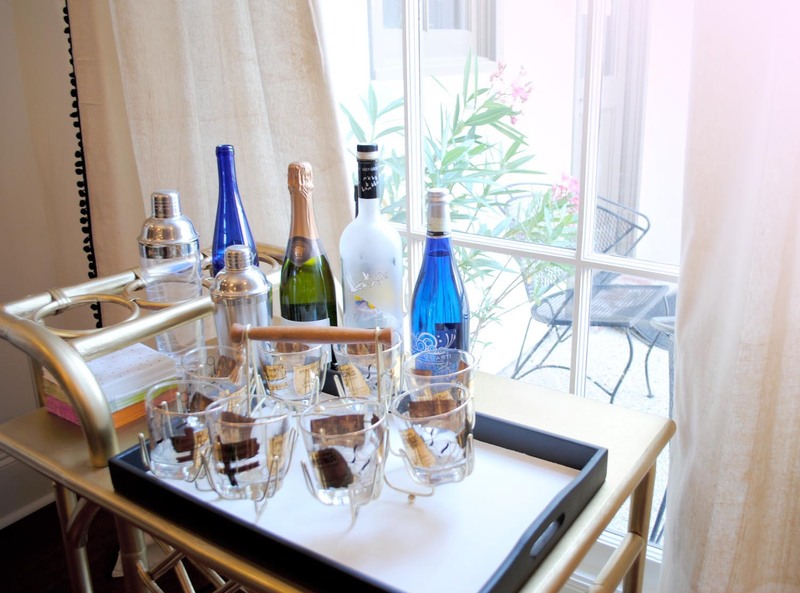 If you are even slightly familiar with this blog and/or my Pinterest boards, you’ve noticed my obsession with bar carts. I’ve been pining away over them for years. I had plenty of bottles to fill it up with, but no cart. 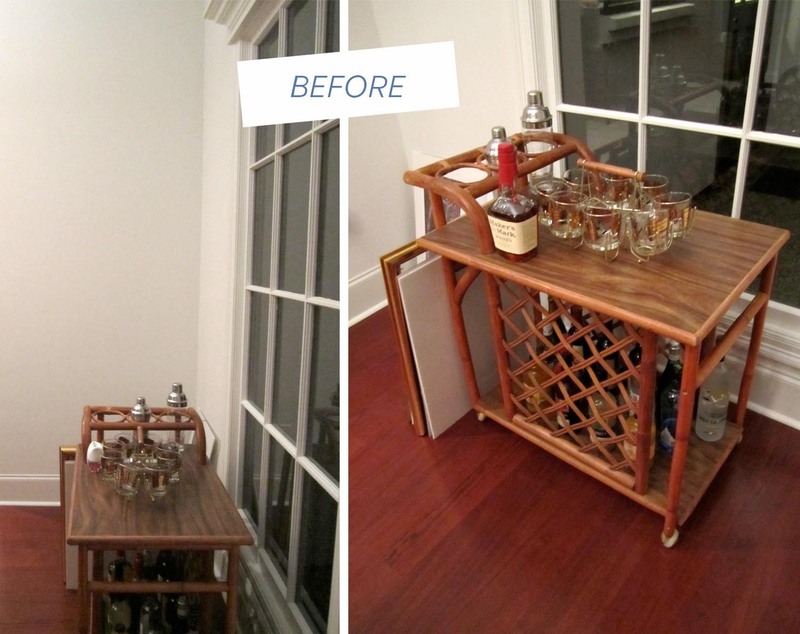 It took searching and lots of patience, but I finally found my perfect, vintage bar cart. I couldn’t believe it, but the people were practically giving it away… crazy! It was a little dusty and needed some TLC, but it was mine. One gold paint job later, and it’s one of my favorite things in the house. 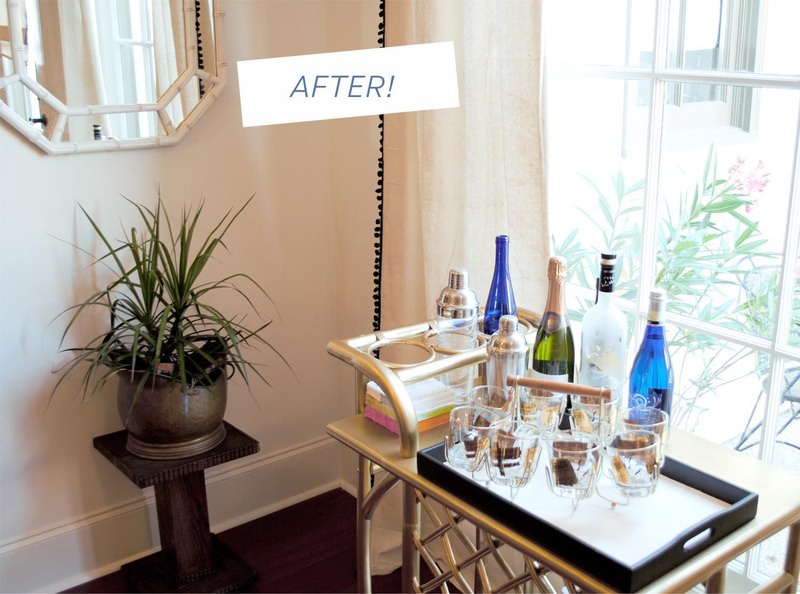 I topped it with a tray and a set of vintage bar glasses. Fancy, right? 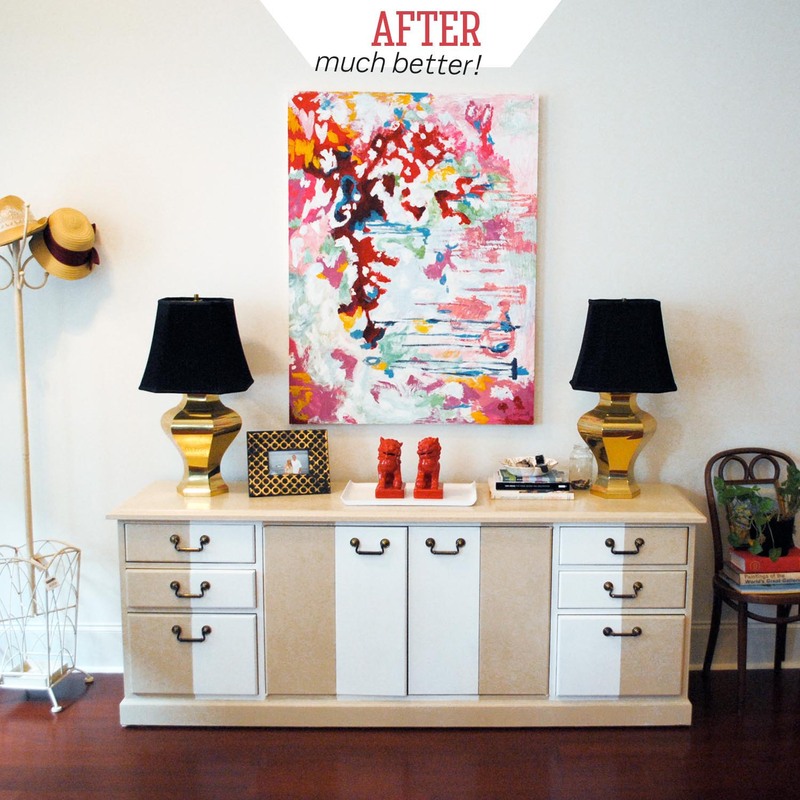 I showed you my painting a couple of weeks ago, but I didn’t show you where it was going – and here it is in our foyer! 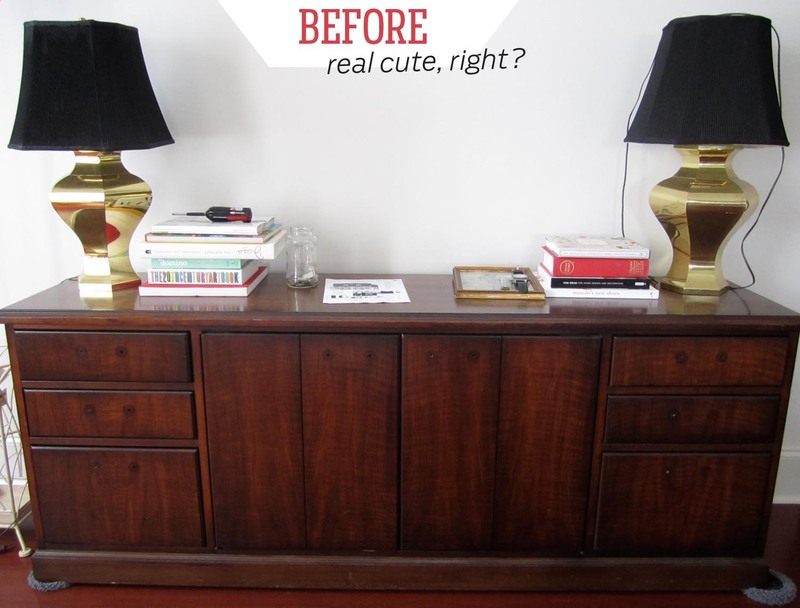 I think Jordan thought I was crazy when I bought this used credenza, but I knew that I had a special plan for it. The wood matched the wood floors in the house which made it boring and bulky – definitely did not flow with my white and airy walls. 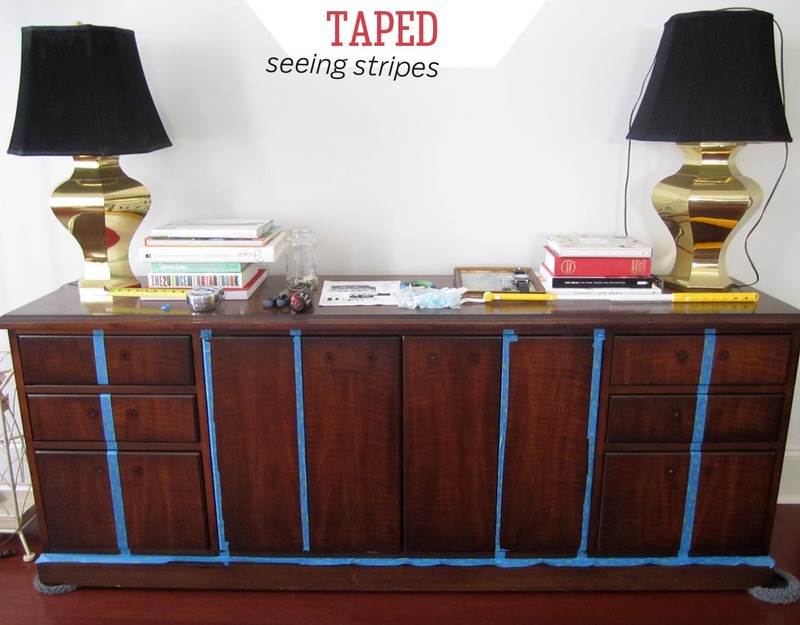 After much research (aka Pinterest), I narrowed it down to stripes because of the even proportions of the drawers and doors. 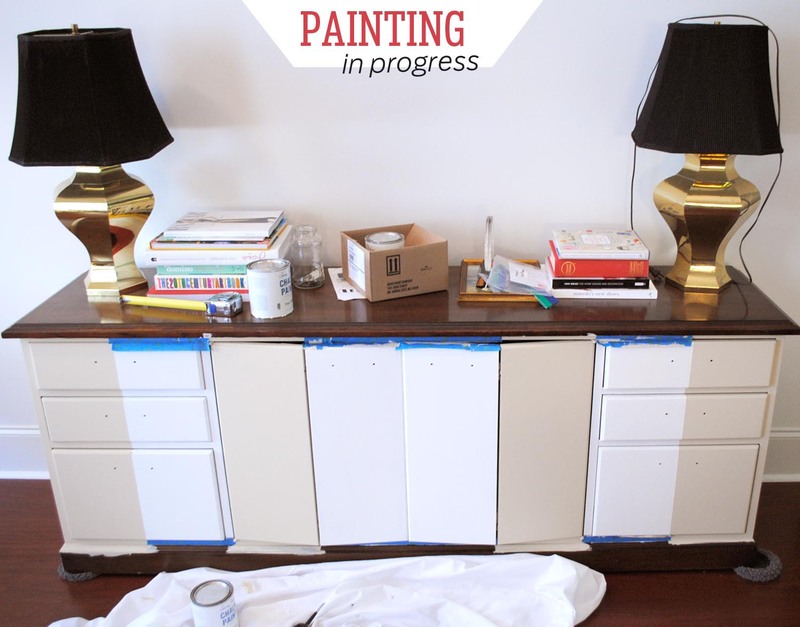 And have I mentioned how much I love Annie Sloan paint? Yes, I know I have, but I must emphasize again how amazing it is to skip the sanding and priming steps when painting wood furniture. It only took two coats of paint and a poly-crylic coating on the top. If you’re in Baton Rouge, both LD Linens and The Nest carry Annie Sloan paint. 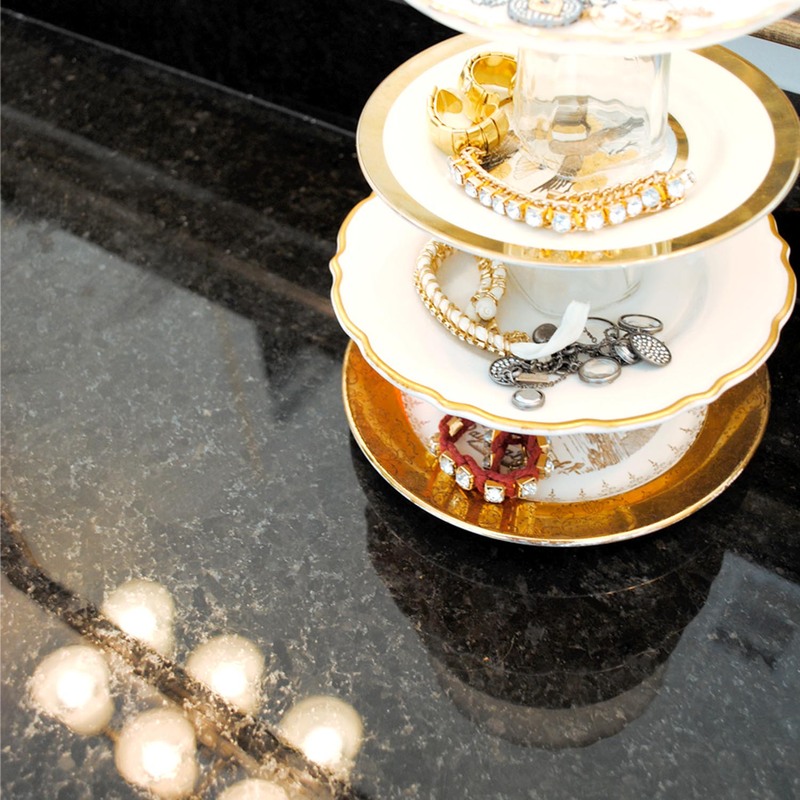 I was looking for a solution to my mounds of jewelry laying around the bathroom counter. Sure, that’s what they make jewelry bags for, but my jewelry never seems to make it back into them – especially the pieces I wear the most. After an exhaustive search, I still hadn’t found my perfect solution, so I decided to make it. 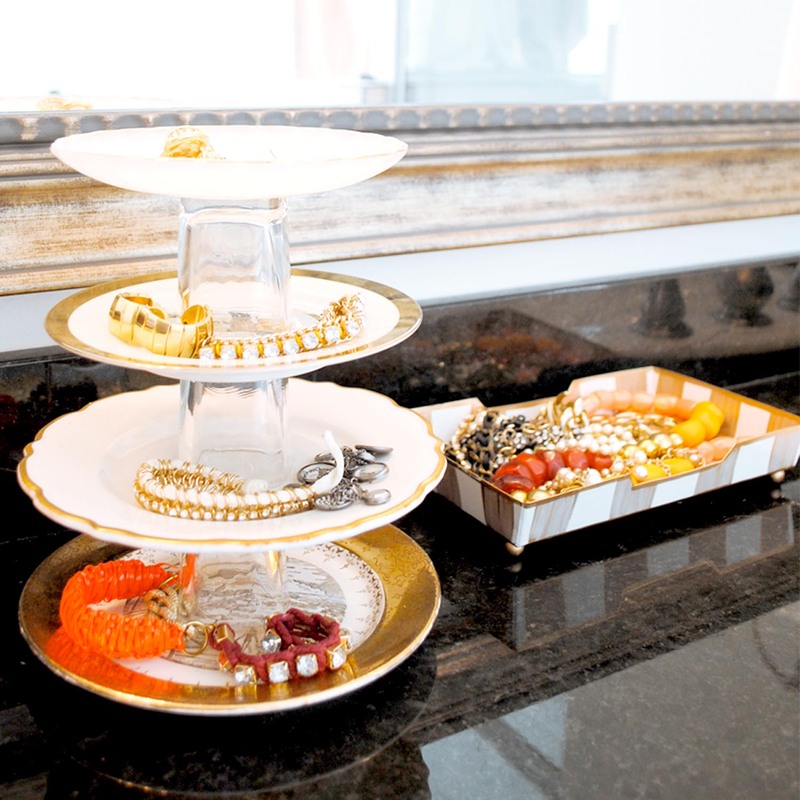 I’m sure you’ve seen the tutorials on how to make your own cake stand out of a plate and a candle holder… but I thought I’d use the same concept on a smaller level… and stacked. I found these beautiful dessert plates at an antique store for about $1 each. I picked up the ones I could find with gold edges and details. Not so much luck with finding suitable candle holders. I needed them to be skinny, but most of the time they ended up being votive holders that were too short. Somewhere along the way, I realized shot glasses turned upside-down would be the ideal solution. 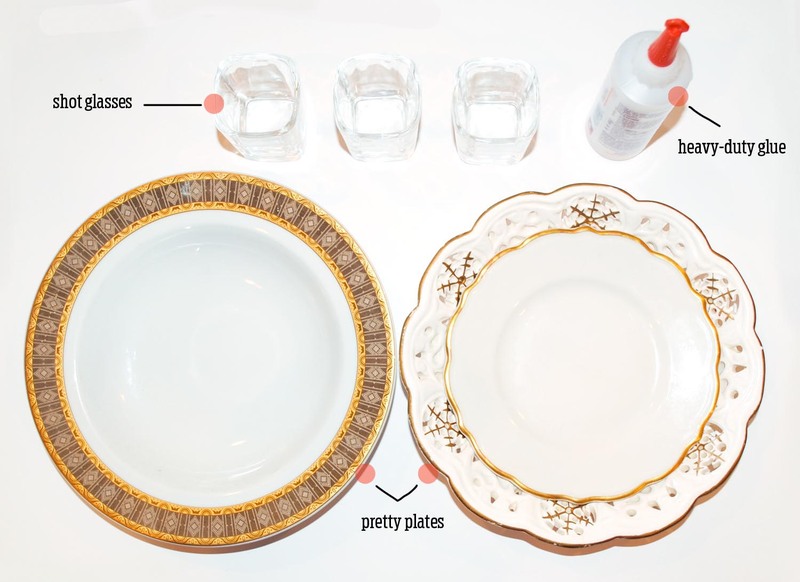 Starting with the widest plate on bottom, glue the shot glass in the middle of the plate. Add a plate on top and so on. Let it dry overnight, and then start adding your jewelry on it. I absolutely love it. It’s a life and time saver for me in the mornings. No more digging around to find my pyramid studs or untangling my necklaces. 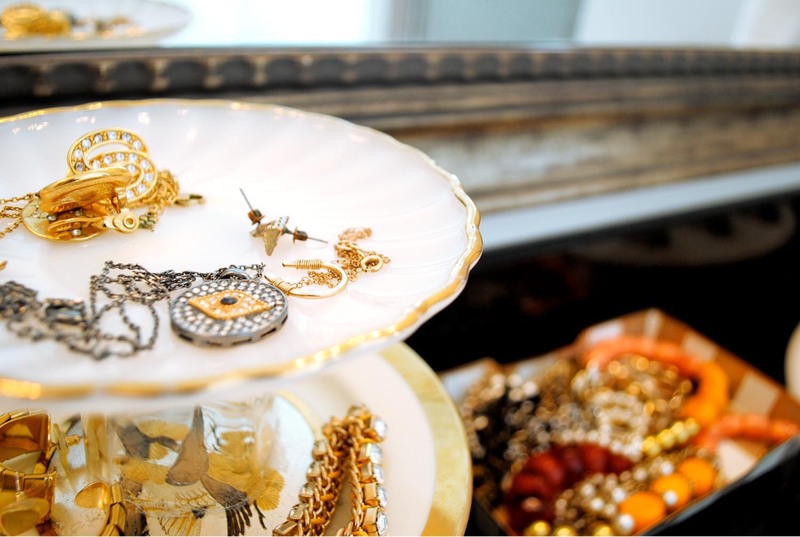 I think if done with pretty plates, it would be a great gift idea too!